I’m someone who firmly believes screenplays should be treated as literature. For a guy like me, I this Film Scripts Series from Applause Books is dead on the money. Great scripts, great writers, published as shooting scripts with formatting correctly preserved — unlike so many screenplay books out there, with their tiny pages and non-monospace fonts. Ick! Those who have studied screenwriting know the trouble that writers go to have their story flow visually on the page and how essential it is to see the original formatting. An update of the 1971 series edited by George P. Garrett and O.B. Hardison, Jr., this re-issue, under the editorship of Jane R. Gelfman, offers three classic scripts in each volume. Each volume also contains an identical introduction which covers film history and the screenwriting process, an appendix with pages from a shooting schedule and a glossary of terms, making any of them appropriate as textbooks. A minor quibble: this series does omit the original page numbers. While they could be back-calculated, other screenplay collections, like the excellent Preston Sturges compilations, do keep the page numbers. 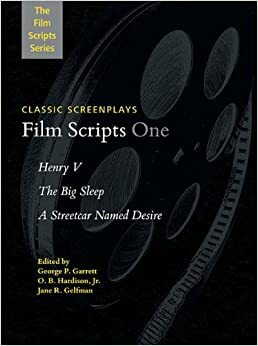 But any quibbles are minor considering the caliber of scripts represented in this series; classic screenplays faithfully published are quite difficult to find. That makes these volumes well-worth adding to the gift list for any aspiring screenwriter or film history buff. I applaud Applause for doing right by some great material. Henry V is one of the rare cases where they did not publish a shooting script, since British studios did not preserve these drafts, but instead a post-editing conformed script. Opening with Henry V is an odd choice in some ways, especially since the release draft form of it is thick with camera acronyms. Don’t get me wrong, I’m a huge Shakespeare fan and this is perhaps the most influential of all cinematic adaptations of Shakespeare. But for introducing readers to screenplays as literature, I recommend skipping ahead and perhaps coming back later. Next, we have Oscar Saul’s adaptation of Tennessee Williams’ Broadway play A Streetcar Named Desire. The introduction informs me that it is the most successful of Tennessee Williams’ film adaptations. The great thing about the version published here is that it contains deleted passages as footnotes below, so you can see how the script was streamlined in a series of ten drafts that continued into the shooting. This is a collection of three classic civic-minded films. While 12 Angry Men and The Defiant Ones perhaps show their age, it is the parable of Hollywood witch hunts High Noon that remains current. It is one of the most classically-structured stories and the Ur-example of how to tell a parable for the modern day using Western tropes. Billy Wilder is one of the all-time great screenwriters (forget how great he was as a director) and The Apartment is one of his all-time great scripts. It is a real treat to have it here, making the The Misfits by Arthur Miller (playwright of Death of a Salesman) and Charade (by Peter Stone based on a story by Stone and Marc Behm), one of the great caper films, icing on the cake. This volume has The Best Man (1964), a Hollywood political satire by Gore Vidal, sandwiched between two classics of the British New Wave: A Hard Day’s Night and Darling. A Hard Day’s Night was the rollicking Beatles comedy and is best known for all its camera tricks, most of which are not even hinted at in the script. Darling is by Frederic Raphael, a writer whose most famous screenwriting work might well be the Stanley Kubrick-directed Eyes Wide Shut. Darling launched the careers of director John Schlesinger (Midnight Cowboy) and actress Julie Christie (who won an Academy Award for her role). Anyone interested in the British New Wave will want to take a gander at this volume. All in all, this a great series of thick books that look great together on the shelf. I hope this re-issue will stimulate some new volumes with all the great screenwriting that has happened since 1971, and some further research that explains more of the evolution of the form of screenwriting and its particular art. (Some time during the era these scripts cover, writers went from thinking in terms of “reels” or sequences to thinking in terms of “acts” — especially the three act paradigm of writing guru Syd Field. Reading these scripts gives you a front row seat to the modern-day form of screenwriting coming together. Highly recommended. Full disclosure: Copies of the books were made available to the reviewer by the publisher, with no expectation about the nature of the coverage.